The big game has come and gone, but it feels like there’s always a major sporting event around the corner. Did your team finally win the championship? Maybe it’s because you were wearing your lucky jersey and you want to get it framed for posterity. Better yet, maybe you got your jersey signed or actually got a game-worn jersey from one of your favorite athletes. There are few things more tragic than a well-meaning family member washing off autographs and grass stains from your favorite sporting memorabilia. But there’s a good solution to that! Did you know you can get your favorite jersey framed just like you would your favorite piece of art? Well, you can, and here’s how you can take advantage of jersey framing. Even Danny Amendola keeps a framed jersey in his house. Find out more about how you can immortalize your own jersey forever. 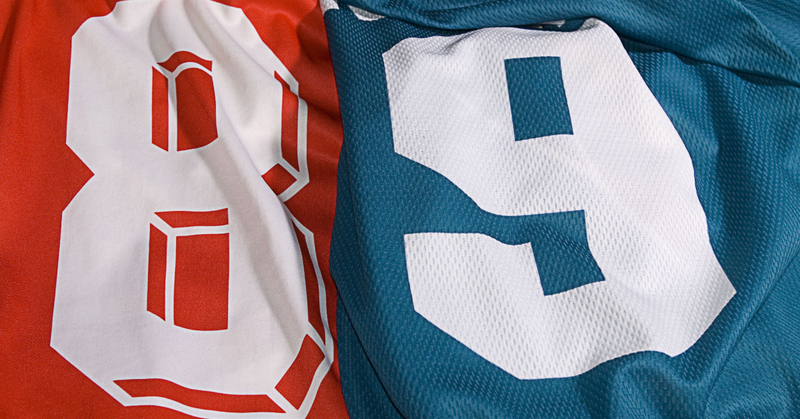 There are a couple of different ways you can have your favorite jersey framed for the big game. The two most common options are either an open flat presentation where the jersey is sewn in and displayed within a frame, or you can hang your jersey within a locker-like setting with the option to add in-game souvenirs like caps or signed balls. You can find all kinds of inspiration and examples of jersey framing on Pinterest, or ask our friendly and inventive framing staff if you need some ideas. A jersey shouldn’t be framed in the same way a piece of artwork is, the matting should match the material. Since a jersey is fabric, you shouldn’t use plain mat board. Instead, you need to use a fabric matting to create an even look within the frame. Take into consideration the weight of the jersey. Certain sports, like hockey, have heavier jerseys. The heavier it is, the more hanging support it will require when being sewn to the backing board. First, decide if you want the front or the back of the jersey on display. Once you’ve made this decision, you can then move on to cutting out a piece of cardboard that fits somewhat snug inside the jersey and creates the shape you desire for display. The top of the jersey needs to be secured to the cardboard by sewing through the fabric in 2-3 spots (depending on the weight of the jersey), and then the sleeves and emblems should be placed and secured by pins in the position you want the jersey to be displayed once hanging. A framing locker is a fun and useful way to frame a jersey if you still want to wear it on game day. The front of the frame swings open on hinges allowing you to open and remove the jersey from its hook, wear it, and then return it to its locker. The front glass panel swings open and closed on barrel hinges. The depth of the locker also adds a sporty feel to your jersey display. This makes it a great option for man caves or children’s rooms. Using a framing locker means your jersey doesn’t have to be sewn in or secured in any way other than the clothing hook at the top of the framing box. The jersey is meant to hang naturally, like it would in a sports locker, and creates the classic locker room feel. However, if you don’t intend to wear your jersey and only want to put it on display, you should consider using open flat framing to better protect your jersey from damaging elements by way of the sealed frame. Talk to the custom framing experts at Jerry’s Artarama to learn more about custom options and what will work best for your jersey! Don’t leave your jersey on a hanger in the closet, put it on display for your friends and family to see (or to boo) when they come over for the big game. Open flat framing will protect valuable, signed jerseys while the locker can put the finishing touches on a themed sports room or man cave while still allowing you to put it on for game day. Whatever you decide, you’ll be able to proudly display your jersey for years to come (or until your spouse makes you take it down).